First of all, I’ll have to say that I actually watched the film before I read any of the novels, and therefore thought I already had a pretty good idea of what was going to happen in the novels. It turns out I was both right and wrong. The interesting thing about the film is that while it generally seems to be in line with the novels, there are some decisive differences that make it better as a stand-alone film, even though it tentatively tries to suggest the possibility for a sequel at the end. 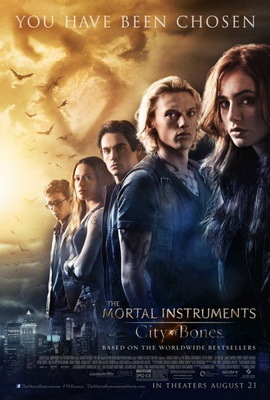 So rather than making it necessary to have six films (or even three, as The Mortal Instruments was initially conceived of as a trilogy), it manages surprisingly well to bring events somewhat full circle, something that is obviously missing from the novels. Even then, it’s not just a matter of shortening the story; it’s brought to a different end than the original trilogy has. So for anyone who is familiar with the novels, the film is definitely going to be surprising, but I believe it also makes a bit more sense this way. Now, I wouldn’t go as far as to say that the film is scary as such (and coming from me, who cannot deal all that well with horror, that means something), but the film definitely attempts to be darker than the novels initially are; the changes in the story invite it, and the possibility to visually express all these strange events makes it even necessary. However, what it also does in the process is make it more cliché, and it appears that once again, a bunch of aspects from other fantasy films are happily thrown in the mixer to the point where, sometimes, it appears ridiculous; at other times it definitely has its merits. Another change that I felt when comparing the film to the novel was that the characters did not always match the way the characters were described in the novels. Of course adaptations do not necessarily have to be religious about their source, but I found it noticeable because some characters seem to have quite a different personality – Alec (Kevin Zegers) comes to mind, whose changes seemed to make less sense. I’m not sure if this was due to acting or because of specific artistic considerations. Overall, though, the changes from novel to film in both characters and story seemed slightly more real now, especially when it comes to Clary (Lily Collins) and her mother (Lena Headey). For Shadowhunter fans, the film is probably great to watch, simply for the alternative way that this whole narrative could go. I’m not sure if I would recommend it to people who aren’t familiar with the series though, but either way, it is light and entertaining enough to become a fun experience. Read up on the rest of the Shadowhunter world in my reviews of The Infernal Devices, The Mortal Instruments, and The Bane Chronicles!